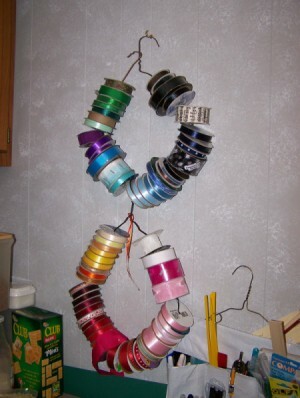 Using wire hangers can be an inexpensive way to organize and store your ribbon supply for crafting and gift wrapping. This is a guide about using metal clothes hangers to control runaway ribbon. After several tries, this hanger method seems to be working the best for me. I can see every roll, pull off what I need, cut it and I don't have the roll laying on my table to be put away or in my way. I just opened up a hanger, slipped the rolls on and hooked the hanger back together. As you can see, I grouped the rolls by color.